Essay. This Glossary explains the elements of the three charts, the Risk Price Chart, Cash Flow and Portfolio which we refer to in our Posts and which depend on a jargon that is peculiar to us. And we have no other jargon, having reasons to reject most of what passes for “investment analysis“, not because we don’t know it, but because we do know it and we also know that it is wrong, useless and harmful to portfolio investors in the capital markets. Cash. No Good. DOA & 0% unless it’s stolen, spent, or invested. To begin at the beginning, however, we say that an investment is just and only the purchase of risk, and like anything else that we might want to buy for cash or credit, we ought to know the price of it, that is, we ought to know the “price of risk“. And the risk is not volatility, but the possibility that we might not get our money back and a hopeful but not necessarily guaranteed return above the rate of inflation, which is to say a hopeful non-negative real return. That seems pretty natural to us – we’re not investing in order to have a better chance of losing our money – and that is possibly what economists would like to say, but they can’t say it because they don’t know what to say next. 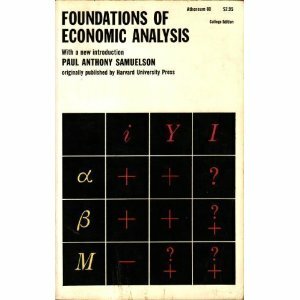 There is no solution to that within the “Foundations of Economic Analysis” but we do have a lot in common with Modern Portfolio Theory. If so, we’d all be rich. We can show that any market partitions into a portfolio of stocks that behaves like a “risk-free” bond (B), and its exact complement in the same market that behaves like an “equity” (N) and is freighted with uncertainty. Modern Portfolio Theory (MPT) and the Capital Assets Pricing Model (CAPM) do something like that too but the underlying assumptions regarding the domain of stocks (or equities and bonds of any sort) and their correlations by volatility are meaningless and such markets don’t exist, not just in approximation, but they don’t exist and can’t exist. Period. 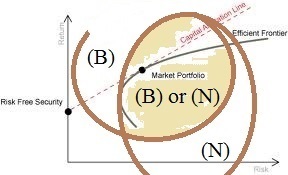 With respect to the diagram above, a company can be (B) or (N) but never both except at the price of risk. Moreover, they tend to be (B) or (N) for long periods of time, months or even years, and can have any “risk/return” characteristic but the portfolio of (B)’s tends not to lose in value and the portfolio of (N)’s tends not to gain in value. And that can be demonstrated. We are grateful for these “craggy” non-linear markets, more like a souk, and it begins with the foundations in investment banking and the business of broker/dealers and market-makers who profit not by taking risks, but by voiding them and passing them on (net of arbitrage profits and service fees) as uncertainty to those who come later in the secondary market which is everybody but them. But when it comes to buying and selling things, including our investments, we’re all like “investment bankers”, “broker/dealers” and “market-makers”. Notwithstanding our “needs” which is another factor and motivates buying and selling, we’d like to have a fair price, not too high (rip-off unless we know something that the seller doesn’t) and not too low (shoddy goods). And the same for the sellers; we’d like to have a “good price” (which is the price of our product and service) but if it’s too high then we’re selling something that we know is a rip-off or, if there’s a buyer, something that we don’t know about; and not too low unless we know that’s all that it’s worth (and “low priced” or “cheap” stocks can be shown to actually demonstrate that modality). The “OK happy point” in this conflicted and self-conflicted buying and selling process that demonstrates the “societal norm of risk aversion and bargaining practice” is the Nash Equilibrium and our problem is to solve the Nash Equilibrium for all the buyers and sellers in the same market, at the same time, and to prove that we have done it. And for that, we can show that it is the “price of risk” that separates the (B)’s from the (N)’s and, yes, we are getting rich on (B)(N) at the expense of the Efficient Market and Risk/Reward guys, and sundry other wing-nuts that are out there. With reference to Exhibit 1 Risk Price Chart below, we only buy or hold a stock if the ambient stock prices summarized by the Stock Price (SP), red-line and a step function, appear to be at or above the “price of risk” which we estimate by the Risk Price (SF), black-line and also a step-function. 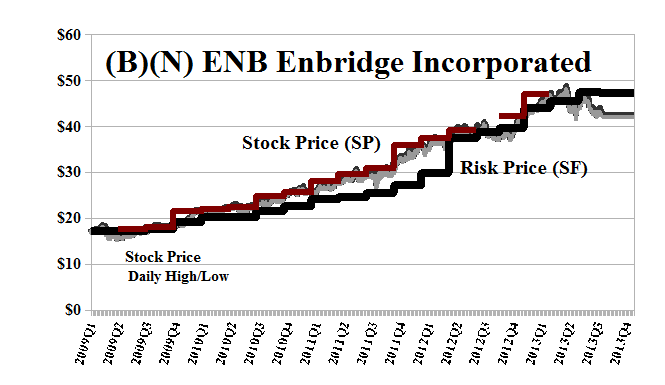 In this example, we bought Enbridge at $18 to $20 in early 2009 and held it through $38 to $40 in 2012, three years later, effectively ignoring all volatility demonstrated in the daily stock price highs and lows during that time, but we did not ignore the apparent fact that the Risk Price (SF) (our computable and provable “bogey” for the price of risk) caught up to and then passed the apparent ambient stock price, Stock Price (SP) (which we then suppress in the chart for clarity). Because of that, we sold the stock or would accept being stopped out using our usual price protection and we did not buy or hold the stock again until six months later when we bought it at a higher price between $42 and $45 (for no other reason than “red line” above the “black line” with the meaning already ascribed) but were stopped out on volatility a few weeks later. Our usual price protection is either a stop/loss calculated for a demonstrated quarterly volatility and moved up if/as the stock price increases above our purchase price; a put against our long position; or a put and sold call at a higher or opportunistic stock price with the same expiry date (usually called a “collar”). If we are stopped out, then we are prepared to buy the stock back at a lower price if the stock price still appears to be above the price of risk. Or we might sell the put and keep the stock. “Purchase prices” are not material and at the market price (which usually differs slightly from the Stock Price (SP) which is “ball park” number) but the “selling discipline” is important and implemented by our “usual price protection” to protect the prices that we have against market “surprise” because we only update the Risk Price (SF) as new quarterly balance sheets become generally available. There is nothing in the model that is “forecast” and we are indifferent to, for example, quarterly earnings reports or their anticipation by the market. We only care about the Risk Price (SF) and the relationship of the stock price to it. 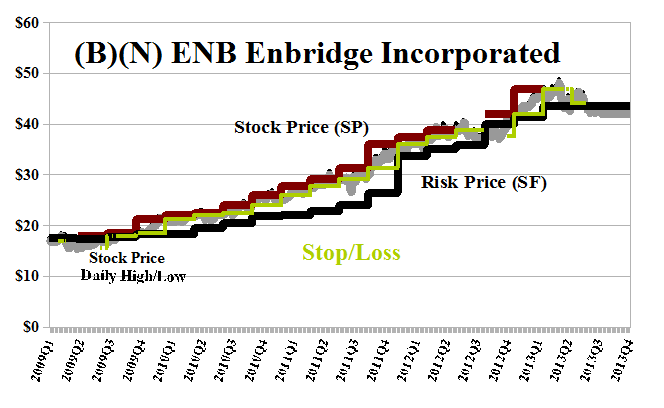 Based on the Chart and confirmed in Portfolio Exhibit 3, we haven’t owned Enbridge since April this year and we sold the last of our holdings at $47. Enbridge Incorporated is engaged in the transportation and distribution of crude oil and natural gas. Exhibit 2 Portfolio Cash Flow Summary has the portfolio cash flow summary according to what we bought and sold, and when, according to (B)- and (N)-transitions and the prices that are posted in the Stock Price (SP) (please see also Exhibit 3 below). We will buy anything on a confirmed and plausible (N)- to (B)-transition and sell anything (or be stopped or put out) on an (B)- to (N)-transition with the usual selling discipline in force (please see the above). The portfolio value is scalable and depends only on our budget. For large portfolios containing dozens of stocks, we will tend to just buy blocks of the same number of shares in each company. For small portfolios with only a dozen or so stocks and large price differences, we will tend to invest the same amount of money in each stock using the “Shares Factor” which is calculated in Exhibit 3 below. The reason is that the risk price should do its work rather than an unusual weighting in a high-priced or low-priced stock relative to the others. The Portfolio line shows the value of the active portfolio, possibly leveraged by the margin account (red Cash) which eventually needs to be paid, hopefully by a successful portfolio increase in excess of the borrowing costs; the Total line is net of the Cash account, and the Companies line shows the value of buying and holding all the companies with no (B)(N)-management. We usually call a portfolio with (B)(N)-management a Perpetual Bond™ on that domain, such as oil & gas, forestry, the entire market, and so forth. (There are many examples in our Posts and any collection of stocks can be a domain.) Unlike a high-grade corporate or government bond with 100% capital safety and an assured return at maturity or by coupons, the Perpetual Bond™ has no time limit and has the properties of “alpha-smart with 100% capital safety and 100% liquidity” by its construction and an indefinite return (such as +96%) that is tied to the equities management model and our policies of risk aversion. Exhibit 3 Portfolio Summary shows the domain and the (B)(N)-status of each company for each month or part of month, depending on when the company is bought or sold at the ambient prices shown on the left of the summary. The $Gap is the difference in price between the current stock price (October in this chart) and the current Risk Price (SF) which tends to be constant for months at a time since it is only updated as new balance sheets become generally available. A negative gap (in red) indicates that the stock is currently trading as an (N) and is below the price of risk. The Delta is our estimate of the downside in the stock price (any stock price for that company at that time) that might be expected in the next quarter due to the demonstrated volatility of the stock price in the past year; it is calculated using the theory of Popoviciu’s Volatility and handily estimated as one quarter of the difference between the high and low stock prices in the immediately previous 52 weeks (shown on the right of this part of the table). The $Stop/Loss Price is the current stock price less the Delta; if that price is below the price of risk, it is shown in red as a highlight that if the stock is stopped out, it will be trading below the price of risk in (N). For more information, please see Exhibit 4 below. The CHG in the chart is the percentage change in the stock price between December and now and the Market Cap ($B) is the market value of the company at the current prices. The Shares Factor on the right of the table can be used to weight the portfolio so that an equal amount of money is put into each company of the domain; the calculation is based on the average of last year’s stock prices. At the bottom of the table, the At $Stop/Loss Prices line shows the effect on the portfolio and all the companies if all the stop/loss prices are hit, such as in a “surprise” market melt-down. 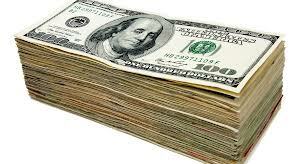 In general, we prefer to buy a put or collar to protect a stock price. In a fast moving market “surprise”, the triggered stop/loss sale (executed automatically by our broker) might not be executable at the stop/loss price and the stock could be sold at a much lower price than we anticipated. Moreover, it’s just a standard practice for brokers or market-makers to “run the stops” which can create additional downwards pressure on the stock price.